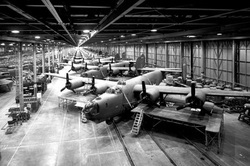 Completed in 1941, the Willow Run Bomber plant was the largest factory in the world under a single roof. Henry Ford had accepted the challenge to build airplanes much in the same manner as auto production. This would not only facilitate faster production but interchangeable parts. This type of airplane manufacturing was unheard of at the time. The total number of B-24s built at Willow Run was 8,685 and during peak production in early 1944, one bomber per hour was produced. There was such an influx of people from the south to work building bombers Willow Run Village was built. This village provided everything: theaters, recreation halls, stores, gas stations, barber shops, the works. The dorms were large two story buildings with small cubicle rooms. The dorms had both male and female residents, which was almost unheard of at the time. Often times these rooms were shared by people on different shifts so when one occupant worked the other slept. The saying was that most of these beds never got cold. The term "Rosie the Riveter" was first used in 1942 in a song of the same name written by Redd Evans and John Jacob Loeb. 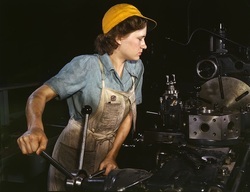 Real-life Rosie the Riveters took on male dominated trades during World War II, including, at the Bomber Plant. This icon of American WWII history may end up in the hands of a Chinese automobile, battery and solar panel manufacturer, who is best known for copying technology and styling from Japanese, American and European automobile manufactures. Unlike American Automakers with a century of manufacturing heritage, BYD was founded in 1995 in Hong Kong, as a manufacturer of rechargeable batteries. In 2003, BYD became the second-largest manufacturer of such batteries. BYD manufactured their first car in just 2003, and in late 2008 they launched their first hybrid cars, the F3 DM and the F6 DM. In this case the letters DM stands for Dual Mode. With the fully-electric e6, BYD is ambitiously embarking on hybrid and electric vehicle manufacture in China. Billionaire investor, Warren Buffet, bought a 10% stake in BYD in 2008 for Berkshire Hathaway. China requires foreign manufacturers to make deals with Chinese companies as an “offset” in order to sell their products in China. This has often led to massive technology transfers to those partners. BYD Auto has announced partnerships with Daimler, to produce electric cars, and with Volkswagen, to produce batteries. It also bought the Audi brand from Volkswagen in 2011. BYD has been the fastest growing Chinese car company but recently it has struggled financially. Berkshire Hathaway’s $232 million investment in Shenzhen-based BYD grew 10-fold in a little over a year and was worth about $2.5 billion by October. That stake is now valued at about $1.6 billion after BYD’s shares plunged 21 percent this year. Sales at the company, the fastest-growing carmaker in China during 2009, fell 19 percent in August 2010, while rivals Dongfeng Motor Group, General Motors and SAIC Motor Corp. each gained at least 19 percent. BYD saw first-quarter 2011 profit shrink 84 percent due to increasing costs and falling auto sales. Everyone knows BYD Auto is in trouble–except, apparently, the most successful investor and entrepreneur in today’s world. These signs are just too ugly to ignore. 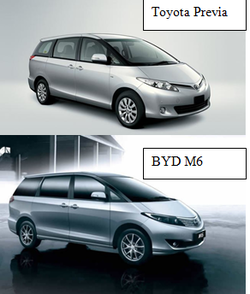 As exposed by many, almost the entire BYD vehicle lineup has been created through copying and stealing designs from other automakers, especially Toyota (see Upcoming Releases: S6, Another Copycar from BYD?). BYD’s EV hype is dissipating, its stock price down 50% in the past five months. BYD was forced to cut down this year’s sales target by 1/4, from 800,000 units to 600,000 units, and yet looks hopeless even to meet the revised goal, as sales reached only 353,000 units in the first eight months and have been falling month after month. Two years ago, BYD said the e6 would hit the showrooms in late 2009; and recently it said the car would be generally available in late 2011 ( see our Keep Dangling the Carrot: BYD Postpones General Release of the All-Electric e6 Yet Again). Since April 2010, BYD has been exposed engaging in fraudulent recruitment of new dealers and ripping-off current ones; several major BYD dealers have since quit. Some like Reuters had expected Buffett to send a warning to BYD and even to announce a sale of it when in China. Instead, the master investor chooses to kowtow to the King of Copycats. In 2009, BYD took a first step in establishing its solar cell / solar panel manufacturing base. BYD’s first solar factory is based in Shangluo City, South Shaanxi province. After a first investment of CNY 500 million, BYD’s annual production capacity is estimated at 100MW. However BYD didn’t enter the solar industry with the intentions to remain a medium size manufacturer. Early 2010 Chinese media reported that BYD made a huge investment in crystalline silicon (c-Si) solar cell manufacturing. The goal is to build manufacturing facilities of five gigawatts of annual capacity by 2015. BYD is investing well over $3.3 billion (To put these plans in perspective: the current largest pv manufacturer Suntech Power is expanding its solar cell and module capacity to a targeted 1.4 gigawatts by mid-2010). If BYD takes over the Bomber Plant and moves production of batteries and solar panels to Michigan, who is likely to suffer? 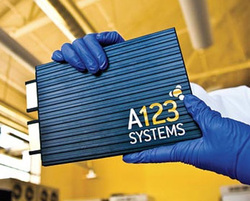 A123 Systems is based on Lithium Ion battery technology developed at MIT with large production facilities in Michigan. A123 has one plant running in Novi, MI, (northwest of Detroit) and there is a second, larger, 300,000 square facility in Livonia, MI. A third factory – similar in size to the Livonia plant – will begin construction later this year. A123 had 169 megawatt-hours of battery capacity. By the end of this year, A123 will have about 360 MWh of annual battery production capacity for large format automotive applications. That's enough for 320,000 conventional hybrids with 1.1 kWh packs or 24,000 plug-in hybrids with 15 kWh packs. 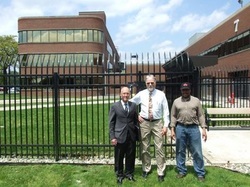 U.S. taxpayers have invested $1.35 billion in supporting the development of automobile battery technology in Michigan. The University of Michigan and A123 systems are part of a R&D consortium of American and Chinese companies and Universities that are funded with $50 million in federal grants and American company money to develop advanced electric vehicles. If Chinese companies move manufacturing or R&D operations to Michigan and hire engineers from companies such as A123 Systems (many of whom are Chinese born) then that major investment may well be transferred to these Chinese companies. Why do we need Chinese partners in this research consortium? The Willow Run plant would also be a great place for BYD to assemble “kit cars” where the parts are all manufactured in China. Yes, BYD would contribute some jobs to the local economy but in the long run won’t most of those jobs just be taken from companies like A123 Systems. If we protect our investment in companies like A123 Systems, they will become major exporters to the world. If we let that technology escape to Chinese competitors then they will be exporting to America. Let’s not let the historic Willow Run Bomber Plant become an instrument that aids in the Chinese invasion of America.